It was time to catch the train again! 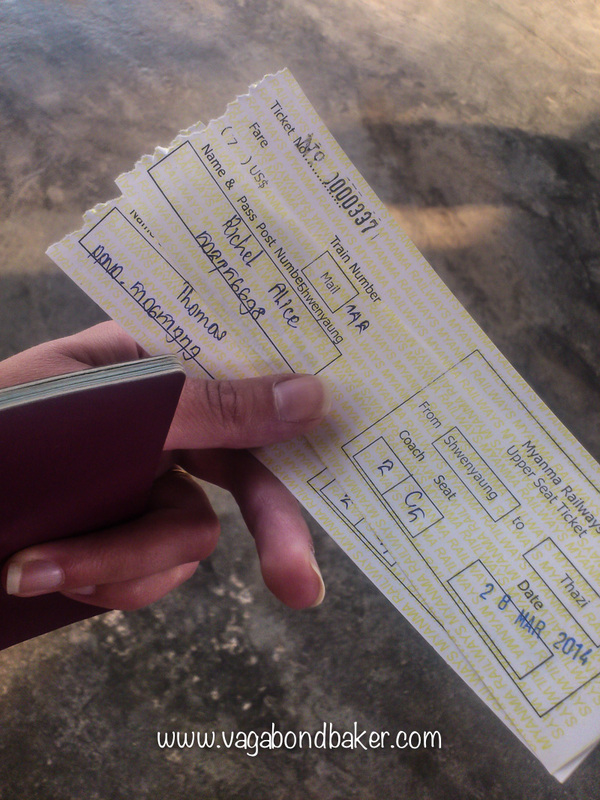 We had three days before our flight back to Bangkok; having opted to fly out of Mandalay, we now had to get there. Our arrival into Naungshwe (for Lake Inle) had been by bus over the mountains, we were now going to repeat much of that journey in reverse, on the Mail Train to Thazi; from there we could then catch the express train to Mandalay. 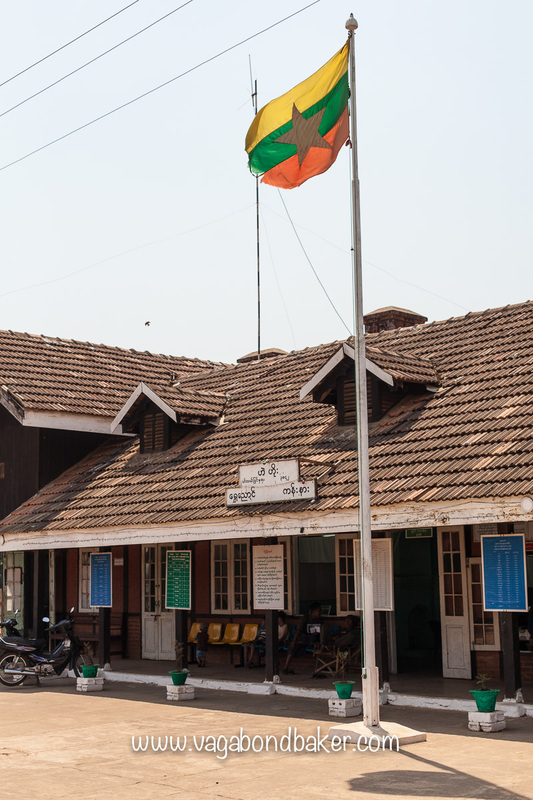 With plenty of advise from the Man at Seat 61 we set off by taxi to Shwenyaung, the nearest town to Naungshwe with a railway station. Our friendly taxi driver cheerily pointed out all the sights and temples we’d failed to see in our too-brief time in the area; arriving at Shwenyaung Station, he walked us through to the ticket office before saying goodbye. 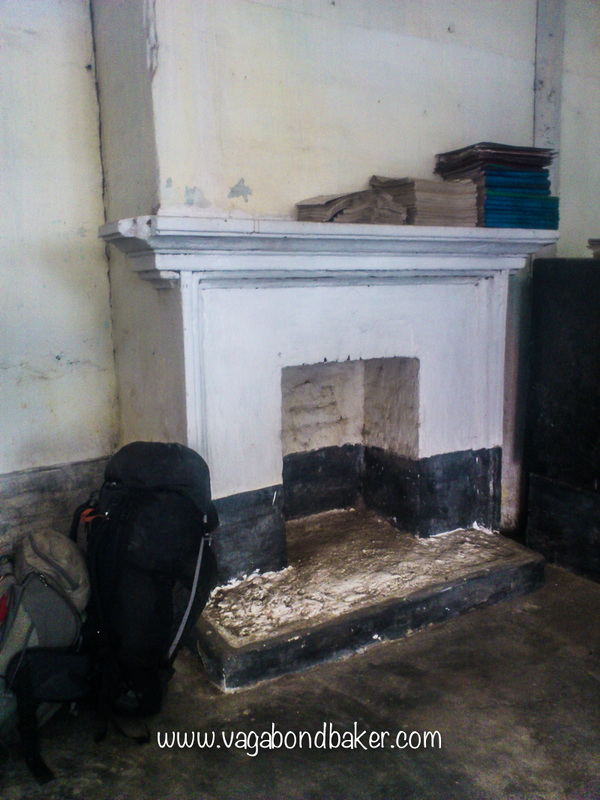 The station was small and neat; the tourist ticket office had a plain fireplace built out of one of the inner walls, it reminded me of many old English railway stations back home: the whole station reeked of colonialism in a strangely out-of-place nostalgic way. Even more strangely, there was a jail in the room: it now appeared to be a tucked away spot for a snooze. We bought our tickets for the Mail Train ($7 each for Upper class seats), a ten-hour journey across the mountains to Thazi; where we would spend the night. The train arrived on time: departure according to the timetable was 9.40am. We boarded and settled into our spacious, but rather dilapidated seats, and waited. We were in Upper class with once-comfortable seats and open windows. 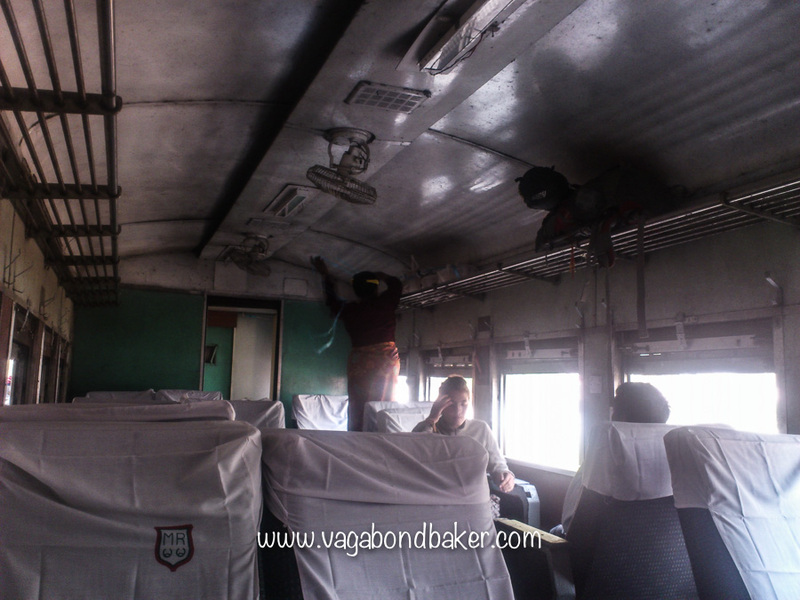 A few more people boarded, lashing their bags to the luggage racks with string: yes, we’d been on a Myanmar train, we knew what this was for! We took the hint and used our backpack straps to secure the bags to the rack lest they get thrown on us during the journey. It became apparent that we wouldn’t be leaving on time. A later announcement informed us that there had been an accident (!) further up the track, causing the delay: the train eventually departed an hour and a half late. 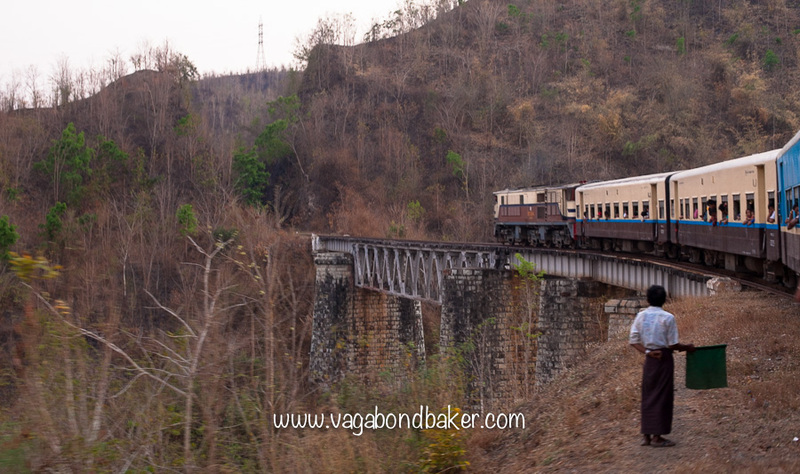 The mail train to Thazi rocks and bounces in typical Burmese fashion! 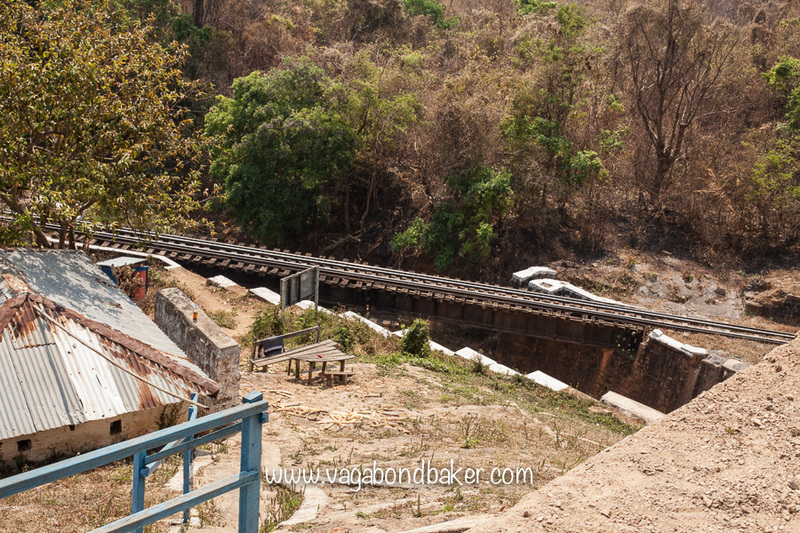 The train followed the road back up the hill to Kalaw, looping round and under ‘the circle of life’: a clever bit of rail engineering to climb this particularly steep section of hill. 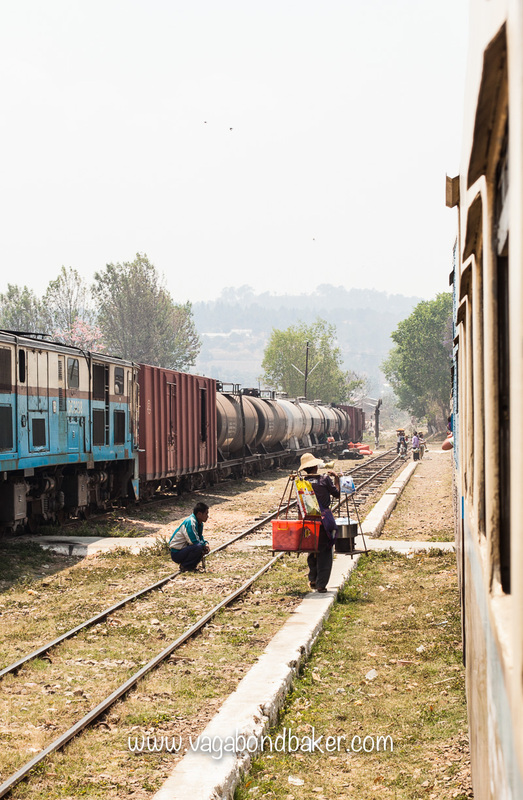 It rocked and bounced in typical Myanmar Rail fashion – thank goodness we’d strapped our bags down! 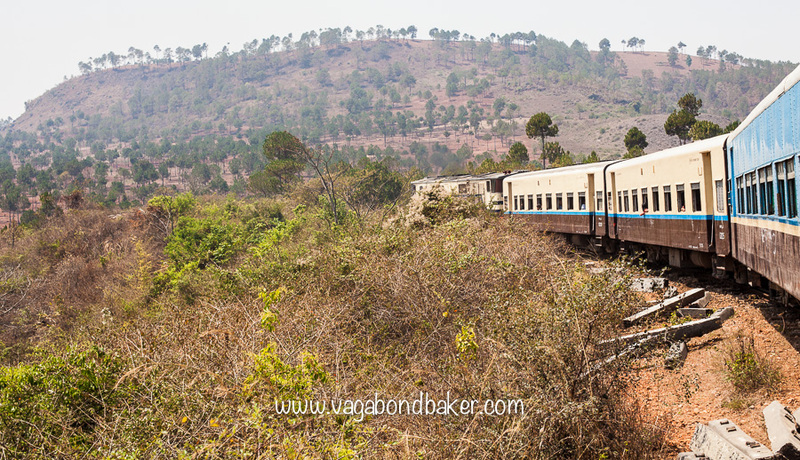 Three hours later the train pulled into Kalaw and the carriage filled. A local woman with three young children crammed into the previously vacant seats opposite us, along with all their baggage. Lunch was fresh samosas purchased from a turbaned vendor on the platform and passed through the window: deliciously crispy and packed with spiced vegetables. 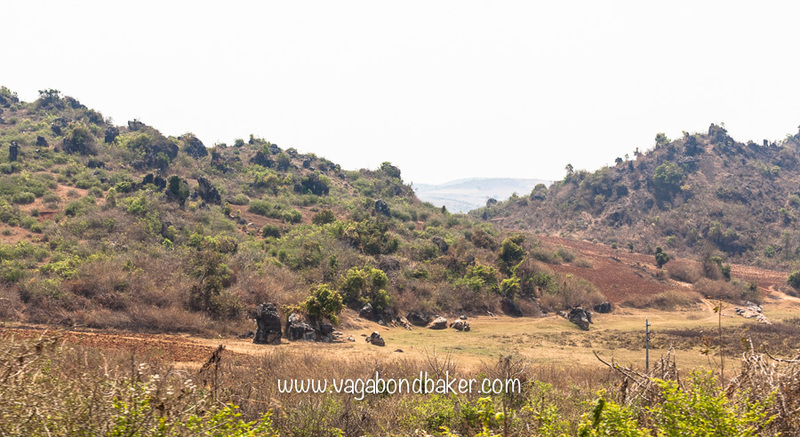 The journey continued, the train climbing further into the mountains along precipitous tracks; the views we’d seen on the bus seemed even more dramatic from the train. 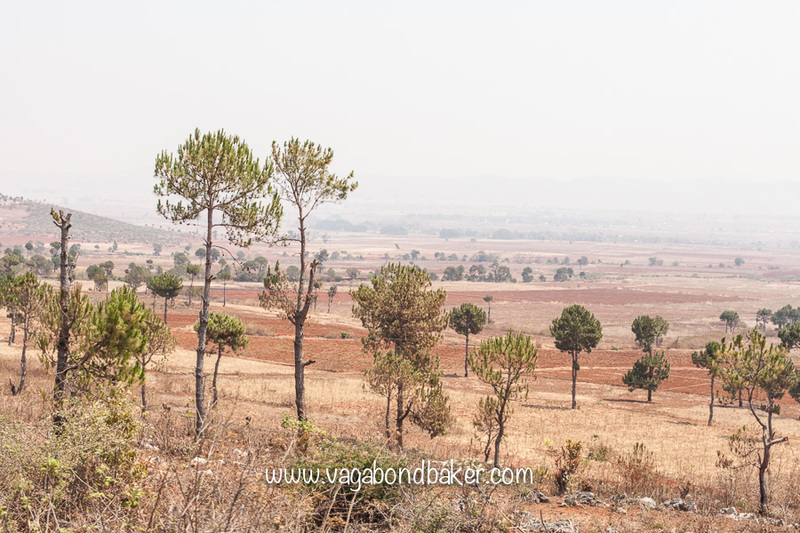 The mountains were forested, dry and brown at this time of year, dropping down into farmed plains with narrow winding rivers. We switched from one side of a mountain ridge to another, passing over gorges on curving viaducts; it was all very beautiful yet lethargically slow. The last few hours dragged a little, I was uncomfortable and restless. One of the little girls opposite me had been perched on a suitcase which she had subsequently slipped between, pushing it into me. She was as uncomfortable and restless as I was, poor thing. The day drew to a close and darkness smothered the land, our vista disappeared. I read and dozed. Eventually (a word I feel I use frequently when writing about Myanmar Railways), the train pulled into Thazi station, miraculously only half an hour behind schedule! Tired and hungry we followed the small crowd off the platform and found the ticket office, stopping to buy tickets for our onward journey. Annoyingly, they wouldn’t sell them to us (probably couldn’t be bothered with all the paperwork at this time of night) and told us to buy them in the morning. We walked the short distance to the guesthouse, hoping they would have room as we hadn’t booked anything. A French couple were unloading their bags off a horse cart as we arrived, they had also got off the train. 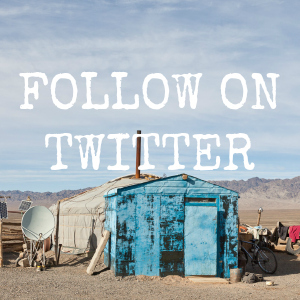 The super-friendly staff at the Moonlight Guest House showed us all what was available, we – arriving second – got a twin room ($10) with fan and shared bathroom (sharing with no one, we four were the only guests), while the French couple got the air-con. Our room was tiny and flimsy yet it had a quaint charm and was clean and neat. 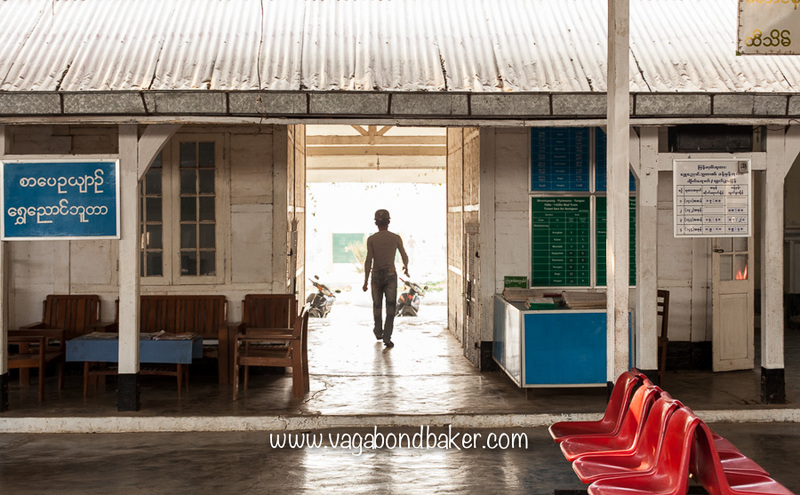 On telling him we intended to take the express train to Mandalay the next morning he was keen to put us off: he’d taken it once; but, it was so terrifying he had never repeated it. He thought the train could leap of the rails, it was so fast and so violently bouncy. 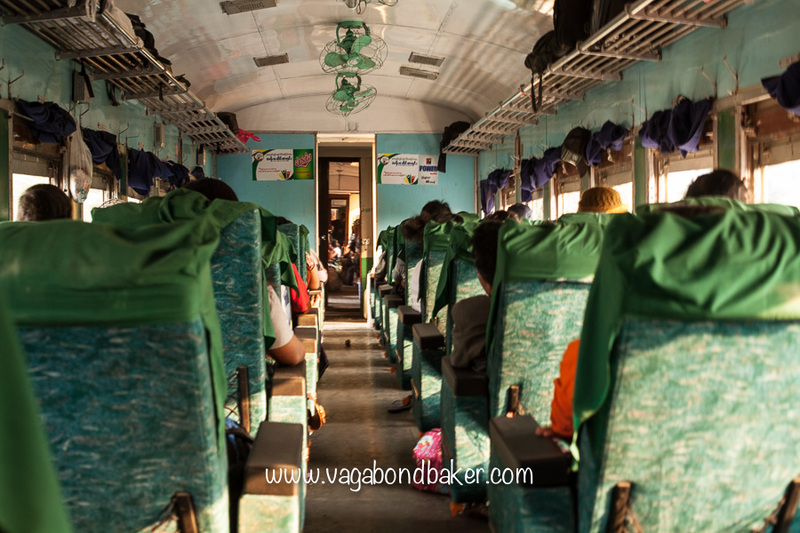 We assured him that we’d already ridden a couple of Myanmar’s trains and we preferred them to the buses. The next morning our alarm went off at 3.30am, we quickly got up, dressed and checked out. The owner’s brother was up and he wished us a fine farewell at the door. We walked to the station, which was already really busy, and I sat with the bags while Chris bought our tickets ($7 each for Upper seat on train No.3). We waited out on the platform, a station attendant pointed to where we needed to stand when the train came, how unusually organized! When the train did arrive (on time!) 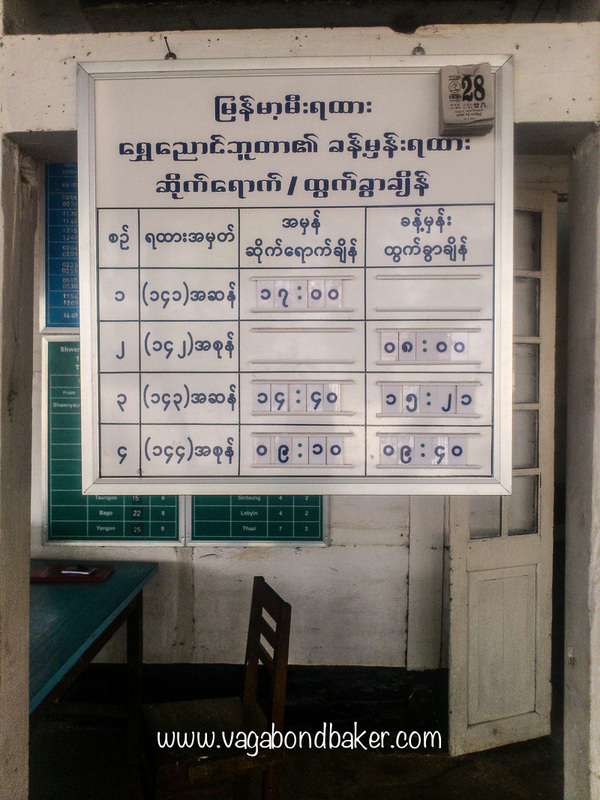 the carriage numbers were in Burmese script but we soon found the right one. 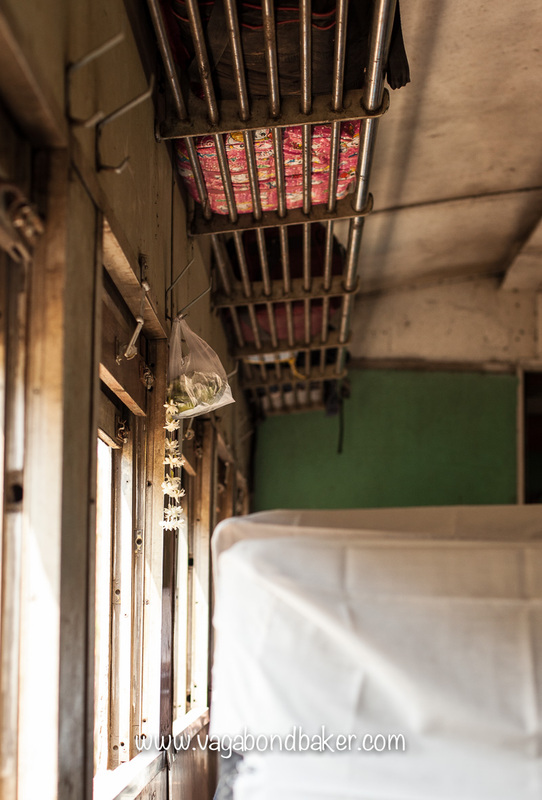 This train, being the express to Mandalay, was already quite full, we found our seats in Upper Seat class: these seats, in fact the whole carriage, was much smarter than the equivalent carriage yesterday on the Mail Train. I snuggled into my seat and the train promptly set off, thundering down the line. I now completely understood the guesthouse man’s alarm at this train, this express train certainly lived up to it’s name. It moved so much faster than any train in Myanmar we’d previously been on, the speed seemed to amplify the bumps and rocking motion. 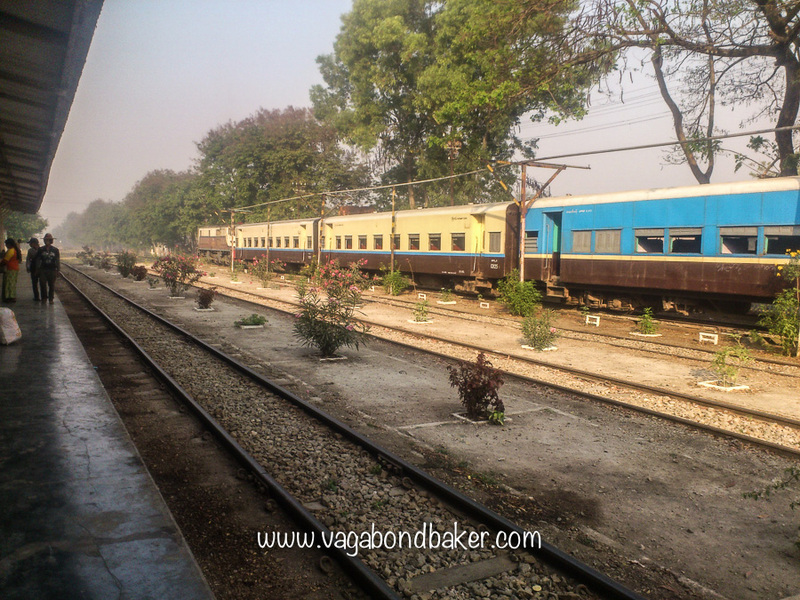 We were violently bounced in our seats as the train hurtled along toward Mandalay: it didn’t feel safe at all! 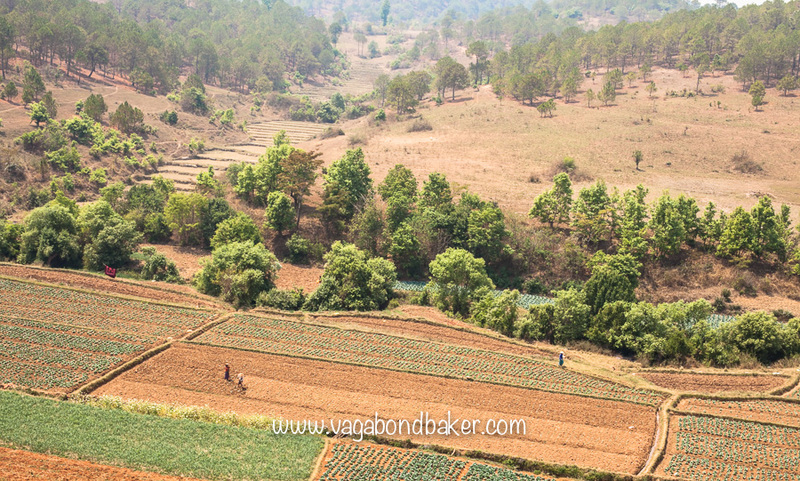 We passed rustic scenes of farming life: bullocks pulling ploughs and turning wells; rice paddies with cone-hatted workers. These pastoral scenes continued and repeated until we neared Mandalay; then the landscape became more urban: brick walls, barb wire, warehouses and abundant, depressing litter. 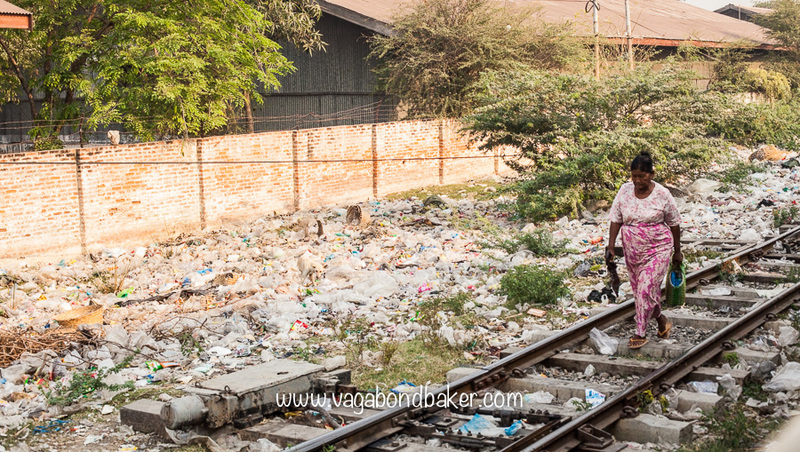 As we neared Mandalay the trackside litter was too abundant to ignore. The journey took three and a half hours and we pulled into Mandalay just before 9am. It took a while for us to get our bearings and find the exit, the station was huge. The temperature outside was unbearable, even at this early hour; by the time we’d reached our hotel (on foot) we were drenched with sweat. Luckily we were able to check in straight away, and our deliciously cool, air-conditioned room became a sanctuary for the rest of the morning. 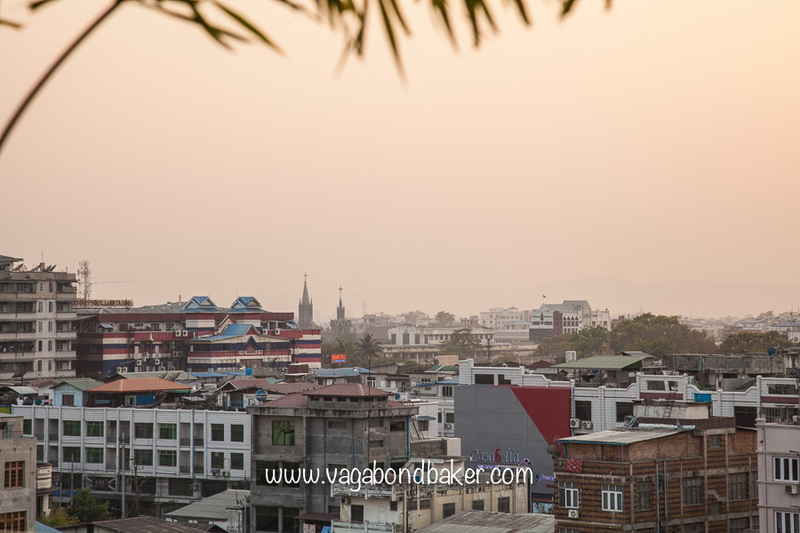 The Hotel Yandanarbon was smart and fancy: a bell boy showed us to our room ($35 for air-con, en suite). We ventured out at lunchtime, washed and refreshed. Under the blistering midday sun, we walked to Marie-Min, a vegetarian indian restaurant down a pretty alley near the palace. A sign out front declared ‘Be Kind to Animals By Not Eating Them’. We feasted like kings, fit to burst. Intending to explore a bit of the city afterwards, we walked back via the palace wall but it was so darn hot and we were travel weary. Our 10 days in Myanmar had flown by, every one an early start and each a day packed with adventure: it had been wonderfully exhausting. Now it had caught up with us, we both yearned for our comfy beds and air-conditioned room. Maybe we’d head out for sunset later, go up Mandalay hill. A poster in the hotel lift informed us that free rum sours were offered in the rooftop restaurant between 4.30pm and 6.30pm, perfect for toasting the sunset. Yes, we were that lazy. Our final sunset in Burma was viewed from a midrange hotel rooftop in Mandalay with a free cocktail (or four). 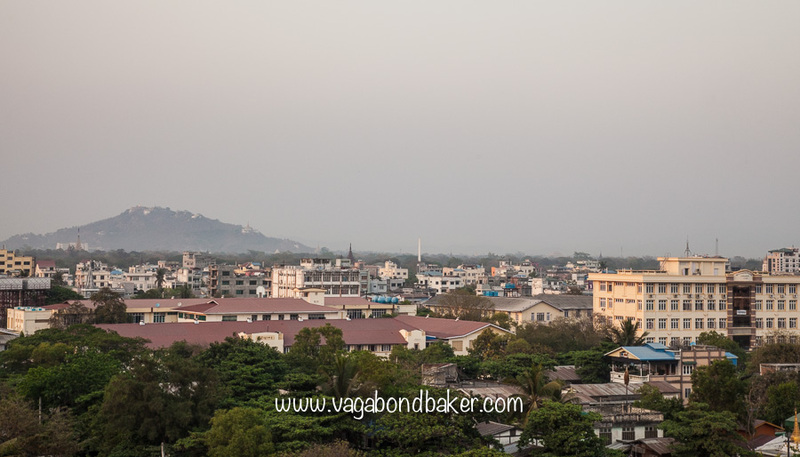 We could see Mandalay Hill, it looked rather pretty from where we were standing! 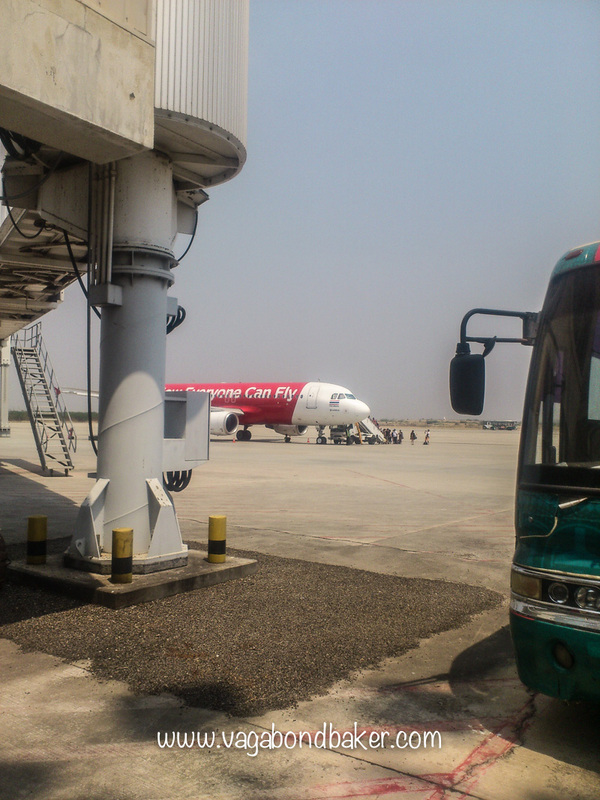 We flew back to Bangkok the next day, having discovered that AirAsia provided a free shuttle bus from the city to the airport, which is inconveniently 45km to the south. 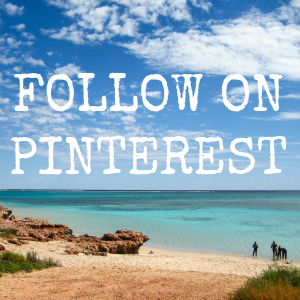 A Ten day trip was not long enough, especially for two laid back travellers like ourselves. 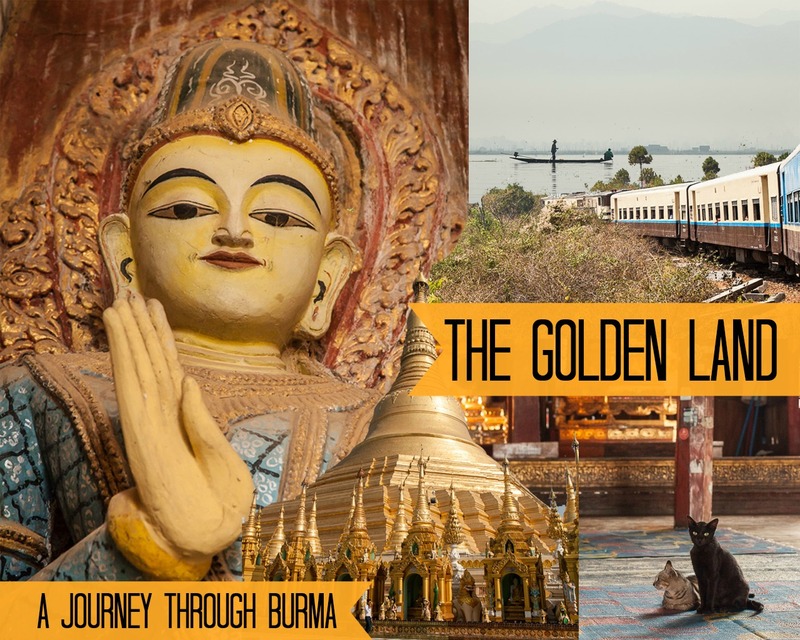 Our disinterest in Mandalay was testament to this fact, we needed to slow down, take a day or two ‘off’ between sights so that we could arrive refreshed and ready to embrace each new destination. 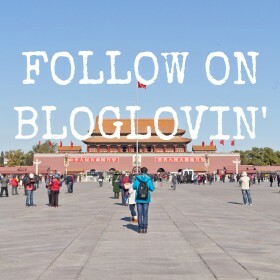 Plus, there was so much more to see, so many more places to go and so many other things to experience. I definitely want to return, Myanmar/Burma more than exceeded my expectations, it is a truly unique and fascinating country. I would wish to return soon though, while tourism is still relatively low and untainted; this is a country on the brink of change. 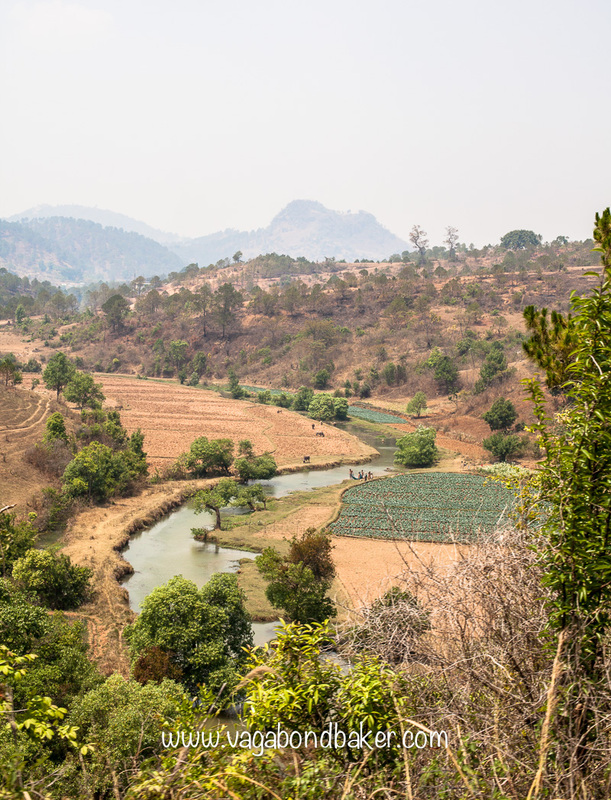 Even on this brief trip through the country, visiting the most touristy locations, we were constantly reminded that Myanmar is largely unspoiled by tourism so far. 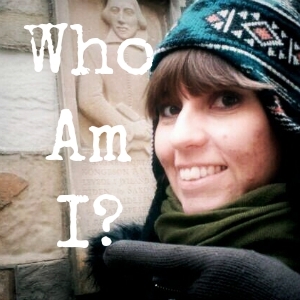 We experienced a genuine, friendly helpfulness that is extremely rare in our tourist-devoured world these days. Mongolia in October is Spectacular! Mongolia is one of the greatest countries I’ve ever visited! 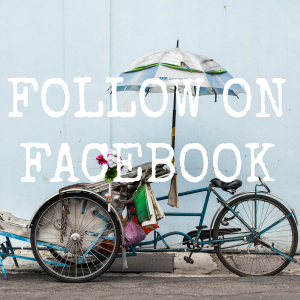 Have I inspired you to visit Myanmar, or awakened some wonderful travel memories from there?